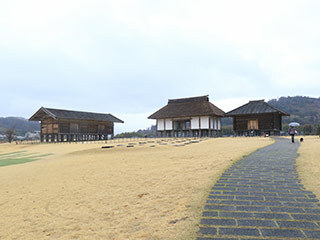 Hirasawa Kangai Iseki is a historical site located in Tsukuba, Ibaraki Pref. It was used to be the capital of Hitachi domain during 7th to 12th century. It is registered as the national historic site. There were used to be the government office buildings, huge storages and governer's house. Today, three major buildings are reconstructed. 3. use a local round trip bus to Hojo Nakamachi. The site of Hirasawa Kangai is the historical site of the ancient governmental town of Hitachi, Tsukuba. It was a capital of this region about 1,000 years ago. A huge storage in this site. Typical stoppage in ancient Japan.